Squeee!!!! It fits! Happy St Patrick’s to all! I thought it was fitting to show you my “pot of gold” at the end of my rainbow…..a finished sock….. I played fast and loose with the cast off edge. I literally finished with 12 inches of yarn!﻿ I’m so pleased with my Rainbow socks so far. I wish the blue section was a little bigger as its my favorite color. But the overall rainbow is just so striking! Jaala with KnitCircus hit it out of the park with this one. The slip stitch heel fits nicely. I am only﻿ loosely following this pattern. But it’s very well written and a perfect base for my mods. Now I just need to cast on the second one! I haven slip﻿ped this off the needles yet to check the fit. I know my gauge at this yarn weight and needle size thanks to my recent sock binge. But even with that these might be a tad bigger than normal. If it is, oh well I guess I’ll just have to redo and keep playing with this wonderful yarn! It’s official….I’m well and truly addicted! Not only have I re-knit the toe but I cruised right along up the foot. So far in fact I have to tink back about 6 rows! My sock is a bit too long and it’s time to start the heel turn. The color change is so fabulous I can’t put it down! I really wanted to enjoy this knit as I have so been looking forward to it! And it’s been just as fabulous as I’d hoped. Spring is in the air and there is a rainbow on my needles! My saga started here with a HUGE yarn splurge from Knitcircus. I then had to wait for needles to free up (see yesterday’s post). And now I’ve finally cast on! I’m working a modified version of Sand dune socks by Trish Halliburton. Modified as in skipping the charted lace portions, working something more vanilla-y, and using 70 stitches. 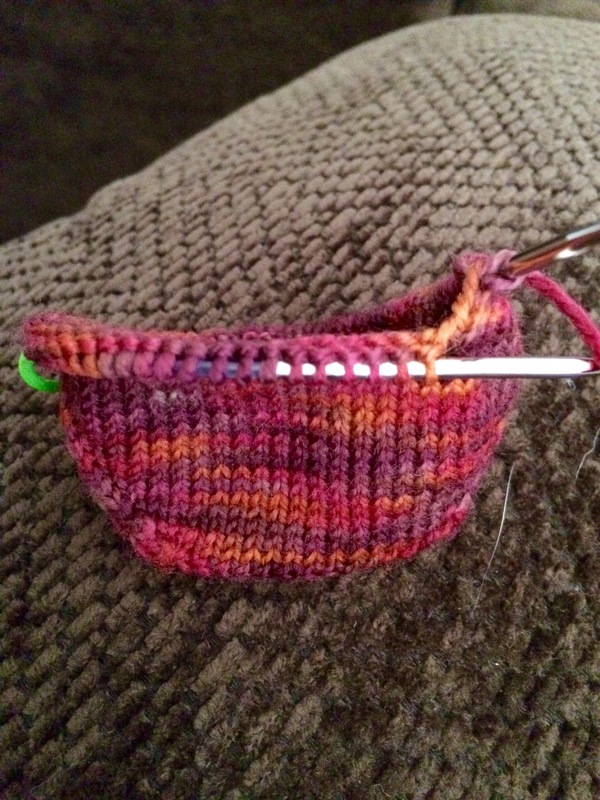 I am using the pattern mostly for the heel turn that will work with the gradient yarn. This yarn starts with red and flows to purple. I’m in love already! Sad part…I didn’t read the toe increases correctly and the above progress has been frogged. Usually this frustrates me but I want these socks to be great and to savor the yarn. So I don’t mind and once more into the breach I go! I couldn’t wait for FO Friday for these. My Happy Socks﻿ in Happy Feet are done. I dealt with that pesky dropped stitch. I had a teeny tiny ball of yarn left and they fit pretty well. Goals accomplished! The 70 stitch count fits a bit better than the 68 I was using before, especially in the foot. I’m considering doing a hybrid on my next pair. Like a 70 stitch foot and a 66 or 68 stitch leg? That way they really hug each area. The best part? I can start my Rainbow Socks!!! I’ve been plowing through my Happy Sock #2. Thanks to some good Jellybean naps, long work meetings, and general knitting obsession I’ve passed the heel and working up the leg! I dropped a stitch when I knit in the afterthought heel. I didn’t notice right away and its dropped down three rows. I managed to stop it and secure it by using some scrap yarn for now. I’m not going to frog back to it, I’ve gone to far and I just want to be done already! My inkling is to ladder the stitch back up and secure it with an extra peice of yarn woven through the purl bumps. Now where is my tiny crochet hook??? It’s no secret I’ve been on a sock binge lately. And I’ve been trolling my sock yarn drawer and petting all the lovelies. It came to my attention that I have some single skein of Knit Picks Felici hanging out in there. How did I do that? You can’t make socks from one measly skein! So I did what any good knitter would do and took to Ravelry. I hit up other Ravelers with single skeins in their stashes and pleaded my case for a swap or sale. And oh boy did they ever come through! I found willing matches for all my colors. Be still my knitting heart! A gorgeous skein and a thoughtful handwritten note! They took the time to wish me and the yarn good luck. I firmly believe that knitters are the best kind of people in the world!! This is the second sock of my is on the needles! Jellybean took a good 3 hour nap this past weekend and I knit the toe increases (twice actually because I had a dropped stitch make a huge whole). I really like the fabric this yarn creates but the toe and heel sections are hell on my fingers. The yarn is not the softest but should make a hard wearing sock.